Breaking huddle at the start of our semi-final game. One of my avocations is coaching a homeschool girls varsity basketball team. It is a fun break from my regular responsibilities and gives me an opportunity to invest in the rising generation in ways that I would not otherwise have. I have written about some of my experiences and philosophy before and today, as we are hours away from the championship game, I thought I’d jot a few thoughts about how I see playing basketball as great opportunity to learn life-lessons. Because far more important to me than the girls learning the x’s and 0’s of the game, I want them to learn about God, themselves and life. I have been incredibly fortunate to be associated with some of the greatest young ladies, parents and volunteer staff in the world. Most of them have been willing to buy into my approach and philosophy, making my job much easier and far more rewarding than if they had not. This year’s team is short on experience but has an abundance of grit, mental discipline and coachability. We have 3 seniors, none of whom have played the game more than 4 years. But they have given incredible leadership this whole year and especially at the state tournament. I couldn’t be more proud of them and of this whole team. Our theme is “basketball to the glory of God,” and the foundation of all that we do is the conviction that it is indeed possible to play sports to God’s glory. 1 Corinthians 10:31 explains it, “So, whether you eat or drink, or whatever you do, do all to the glory of God.” Basketball is mentioned in this verse in the phrase, “whatever you do.” So that’s the goal that we shoot for, and it is what I continuously try to teach. Basketball is not very important. It is a game. None of the girls I have coached have ever gone on to play in college. Most of them would not have an opportunity to play on an organized team if the Lady Ambassadors did not exist. I regularly tell the girls that having fun is one of our goals. If that isn’t happening, we are doing something wrong. God is not against our pleasure. He invented it. So enjoy the game, or whatever lawful activity in which you engage. The ball is the most important thing on the court. When we are on defense it can hurt us and when we are on offense it can help us. So we orient around the ball. On defense, we must always know where the ball is, but we cannot forget our man (or woman, as the case may be!). Just like life, if you don’t stay focused on what is important you will inevitably not come out ahead. This is a great temptation, especially in an exciting game. But if you get caught watching the game then you’re no different than a fan. It takes mental discipline to stay focused on your role and fulfill your responsibilities. Good players will take advantage of an opponent who is caught watching. Again, in life, it is easy to stay on the sidelines and just watch, rather than getting involved in a worthwhile project and contributing. We have played two teams in this tournament with completely different styles. But our girls were able to play our game in both. We have strengths and weaknesses. We always try to play to our strengths and compensate for our weaknesses. When we let our opponent dictate the kind of game we play, we get out of our rhythm and inevitably do not play well. Knowing who you are and what your responsibilities are, then staying focused on them regardless of what circumstances arise, is a key to success. Remembering this is a key to enjoying basketball (or anything) without turning it (or anything) into an idol. Every good and perfect gift comes down from above and Jesus Christ died to purchase these gifts, from the greatest to the least. We must learn to enjoy the Giver of the gifts more than the gifts themselves. Remembering this and fighting hard to practice it sets us free to really enjoy things like basketball while enjoying God more. I really enjoy basketball and I especially enjoy watching young people learn to play it to the best of their ability. Today is our last game of the season and it’s a championship game. That is God’s kindness to us. 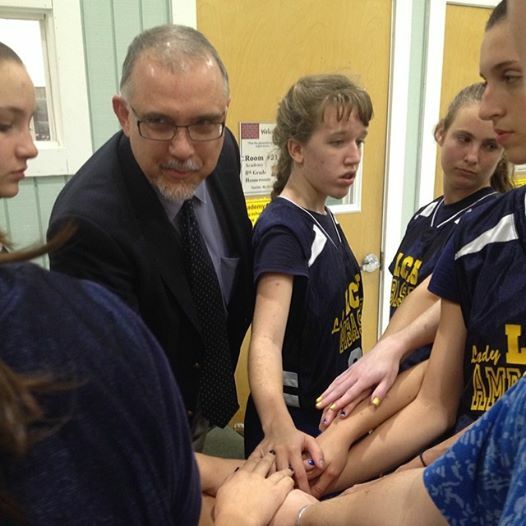 If you think about us, pray that the Lady Ambassadors will play well…Soli Deo Gloria!